Banner Stand sizes are from eighteen inches wide to sixty inches wide. Seventy eight inches tall is the average height. A Retractable Banner Stand may also be sized to your height requirements. 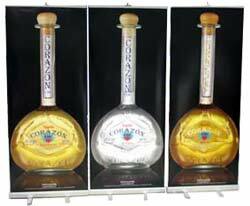 Variety in Banner Stand Graphics capture your prospects attention. Vivid Graphics play a vital roll in capturing your audiences attention. You have three to five seconds to capture your prospects attention. Only eye striking, well thought out graphics will accomplish your desired goal of acquiring a new prospect and a new customer. The benefits to Retractable Banner Stands are they're light weight and convenient. Banner Stands may be ganged together to form a nice back wall for your exhibit. Coldwell Bankers Retractable Banner Stand. The Banner Stand makes a fine compliment to the Portable Pop Up Trade Show Display. Retractable Banner Stands create a professional image. See "How to Make a Good and Attractive Banner Stand." Don't forget your Custom Tablecloth with Logo. A tablecloth with your logo establishes instant professionalism at your tradeshow. A key element to a good trade show display is looking established. It may be your first trade show, but your prospect doesn't have to know that. Give me a call and we can discuss setting up your professional image. A Retractable Banner Stand with a custom Table Cover with Your Logo is a sure way to draw attention to your Trade Show Display Booth. When exhibiting, your Trade Show Display needs to grab your prospects attention. A Retractable Banner Stand is eye catching! The Retractable Banner Stand may be "ganged" to create an inexpensive back wall tradeshow booth. How Our Banner Stands are Made. See Additional Banner Stands - This link will take you to a site I use for sending proofs when clients can't accept proofs via email. You will be directed to www.GraphicProofs.com. You'll see numerous retractable banner stands and get some good design ideas too! Email me with your questions: Mike@ActionDisplays.com For additional help, please feel free to give me a call and we'll discuss your Retractable Banner Stand needs. I'm a real person and we take live calls! So if you're like me and want to talk to a real person, give us a call!